Need a night off from cooking? A gourmet picnic to impress a date? How about a great sandwich to take to the beach? Duckworth’s Beach Gourmet could be the answer to all these desires if you’re in the Gloucester area. 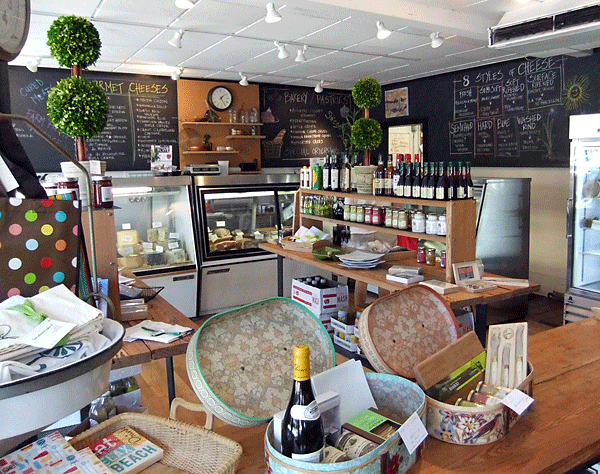 There’s a lot packed into this store’s fairly small space, owned by the folks at Duckworth’s Bistro, including wine, prepared foods, gourmet cheese and charcuterie, and gift items. Indeed, we were impressed with the store’s selection of red wines, supplemented by a cold case with white wine, champagne, Ipswich Ale, several other high-end beers, Reed’s ginger ale, and Harney & Sons bottled juices and teas. Put a bottle of wine with a loaf of Iggy’s bread, a jar of jam, a gourmet mustard (black current dijon sounds good), some wine vinegar, or a bottle of hazelnut or truffle oil, and you’re all set for a hostess gift. If your friend has a sweet tooth, try gourmet tea accompanied by lavender or provence-flower honey, a pretty canister of flavored sugar from local purveyor Didi Davis, a bag of Lark cookies, or a box of Marich candy. For beachgoers, Duckworth’s has hot and cold sandwiches, containers of potato salad (no mayo) and cole slaw, Deep River Snacks chips, individual desserts, and hand-made sandwich cookies with Captain Dusty’s ice cream (also available by the half-gallon). Those looking for help with dinner will find containers of roasted tomato soup and marinara and alfredo pasta sauce, fresh uncooked pasta, house-cured salmon, and prepared foods such as flank steak, haricots vert, chickpea burgers, roasted fingerlings, and pasta salad. Hand-made pies are available most days; go early for the best selection. The deli case is filled with a charcuterie-lover’s dream: serrano ham, prosciutto, and speck from La Quercia alongside pancetta, sopressata, and salameto from Fra’Mani. The cheese selection is extensive, ranging from chevre from Topsfield’s Valley View Farm to New England-sourced Cabot clothbound cheddar, Champlain Valley Creamery triple creme and Seal Cove chevre. 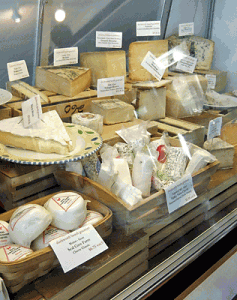 Imported selections include raclette, morbier, robiola, and Delice de Borgone. We stopped in last weekend after brunch at Sugar Mags just to see what was on offer, but we plan to return for sandwiches and treats the next time we head for Good Harbor Beach—seagulls, stay away, please. Oh, you really must try the sandwiches! Everything is of the best quality. What would we do without Duckworth Beach Gourmet?? It’s my first stop for cheese, cured meats, fresh pasta, soups. And btw their catering is impeccable. Thanks for featuring yet another local gem. Nice catering “Gloucester Goes Gourmet at Duckworth’s Market” I guess they also has gourmet tea right there right? since they have a lot of things.